Do you live in a cold weather area? Is your car up to date on all it's maintenance? Getting stranded on the side of the road during a snow storm is no fun! 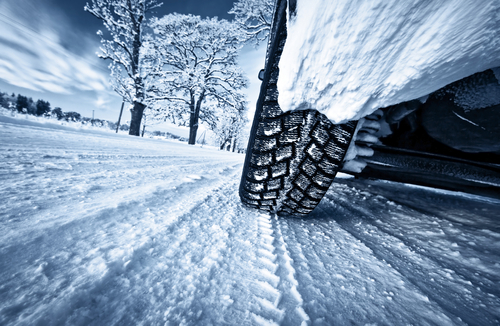 Read through our quick blog to see what you may need to do to get that car into winter preparations! - Replace Dirty Filters such as air filters or fuel filters. A poor running engine is less efficient, burning more gas! - Make sure to top off on ALL fluids and we suggest carrying extra antifreeze with you or keeping it handy at home. Make sure it's the right kind for your car and double, triple check if it's pre mixed or not. NEVER put water into ANY compartment in your vehicle! It will freeze! - Examine your belts and hoses (or have a shop do it). Cold weather can crack belts with ease and cause costly repairs! - Keep the gas tank full (or for you "game on" players, at least above a quarter tank) and add fuel deicer if your vehicle allows. - If you have 4WD or AWD make sure to check the status and LEARN how to use it properly. I remember keeping a cheat sheet written down in my owners manual when I was younger so I knew what to use and when! - Make sure your oil has had a recent oil change and is up to date. We also suggest checking fluid levels a little more in the extreme weather since your vehicle is working a little harder. - If your heat has issues now, do not wait to have it fixed. Driver visibility is a MUST during the winter season. And it helps to be comfortable too! - Not sure if your battery is going to last all winter? Have your battery checked (most auto stores will do this) and get an idea of where to get one last minute if needed! - Have your exhaust system examined. With the windows being up all winter, a leak can be deadly. - Tires. Make sure your tires have a good tread, no holes, bald spots or warps. This is the #1 issue with sliding on ice and snow. Haven't had a good tire rotation recently? It may be time to take it into a shop, or even google a YouTube video on how to do it yourself! Also make sure to check your tire pressure often! You can expect to loose one pound pressure per square inch for every 10 degree drop! Your owners manual will tell you your target tire pressure. We suggest checking every week to every other week! - Check breaks frequently. Brake failure can be costly if neglected. - Speaking of neglect, the transmission is the most pricy repair that is often overseen until a major issue arises. Avoid the issue and get whole car a safety inspection preformed by a ASE certified mechanic or shop prior to hitting the road this winter! As always, make sure to make a Winter Ready Car Kit. We suggest keeping a rubber-made tote in your trunk with everything in it. It may not be for use for you, but think if you come across a pretty bad crash and first responders have not arrived yet, how can you help? You can buy a winter-ready car kit for around $35 from most stores like Walmart - or you can make one yourself. Most of these items we have laying around and can make them for less money! - Family Watchdog suggests keeping a few warm blankets in your car at all times. They don't have to be pretty, but good enough to keep you warm in case of an emergency. - Flashlights are always good to keep in a car all year round. You can find small, cheap flashlights at almost any store for around $1. - Keep a good ice scraper in your car. It doesn't have to be the fancy heated one or even one with a brush, whatever tickles your fancy! - Extra gloves, hats, handwarmers, scarves. Remember, it doesn't have to be pretty. Need to put those handmade ones that grandma Millie made you years ago to use? Throw them in the car ready kit! - If you plan on making a long trip or live way out where help may not get there, consider keeping snacks and water in your car for if you will be stalled for awhile. Also, if your on medications, make sure to carry the ones you need with you. - Carry extra jumper cables. If you slide off road and need a jump, you may need a longer pair than what comes with your car. Look into getting a really good LONG pair of cables. Also, while your digging around in your trunk, make sure your spare tire is good to go! Are tow chains something you want to consider packing? Tire chains? Flare gun? - Keep a small but handy first aid kit in your safety box including latex gloves. You never know, it may not be you needing all these items, but someone who you happen to stop and help! Make a plan for if you get stranded. Do you know where you are? Do you know who to call? We suggest keeping a list in all your vehicles with insurance information, emergency contacts, and tow truck companies and phone numbers. Often during bad storms or driving conditions, tow companies can take HOURS to respond, so try to keep some of the smaller companies in mind too! Also, double check with your insurance company prior to hitting the road to see if they cover towing services for you and if it has to be with a special tow company or not. Happy Driving this winter season!